Every year, as part of my birthday list, I set myself a film challenge. And every year, I end up leaving it until the last minute, and watching a whole bunch of films in the lead up to my deadline, and then at least one film on my birthday itself! I’m so rubbish – I plan to be better next year, but the reality is probably that it will be exactly the same! This past year, I decided on a list of comedy films – the AFI 100 Years… 100 Laughs list. As I said at the time of making my list, I don’t watch an awful lot of comedy films, and I often say that I don’t like comedy films, but maybe it’s just that I’ve been watching bad comedy films. So I thought a list that claims to include the best (American) comedy films of all time would be a helping hand in getting me to like the genre. Here are the twelve films I watched; I started with Broadcast News on 21st January, and finished with The General on 12th November. The earliest film I watched was The General, from 1926. 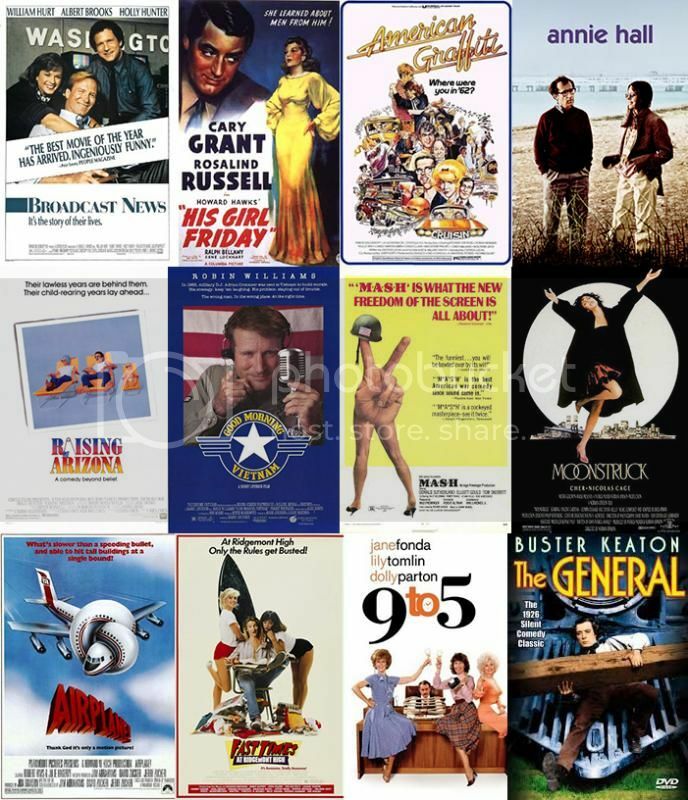 I watched four films from 1987, which was evidently considered a pretty good year for American comedy: Broadcast News, Raising Arizona, Good Morning Vietnam, and Moonstruck. These were the most recently made films I watched, though it’s worth noting that the list was made in 2000. As far as I can tell, the only actor that any of the films have in common is Holly Hunter, who is in both Broadcast News and Raising Arizona. I adore Holly Hunter, so I’m always happy to watch her in just about anything, though I much preferred the former of the two films. Of the twelve films I watched, seven of the films were nominated for Oscars, and three of them won, including Annie Hall for Best Picture. In all honesty, I didn’t enjoy that many of these films. I loved Broadcast News, and wouldn’t think twice about watching it again. His Girl Friday was entertaining, and I did actually laugh out loud at Good Morning Vietnam. But other than that, I wasn’t generally a fan of many of these films. I like to emulate my favourite movie critic in saying that I have a tin ear for comedy, but in truth, I do laugh at comedy, though it tends to be television programmes, and more specifically British humour is what floats my boat. I’m glad I watched them though, there’s always value in trying films that are outside your comfort zone. I will be keeping my list going, and crossing off any that I watch in the future!